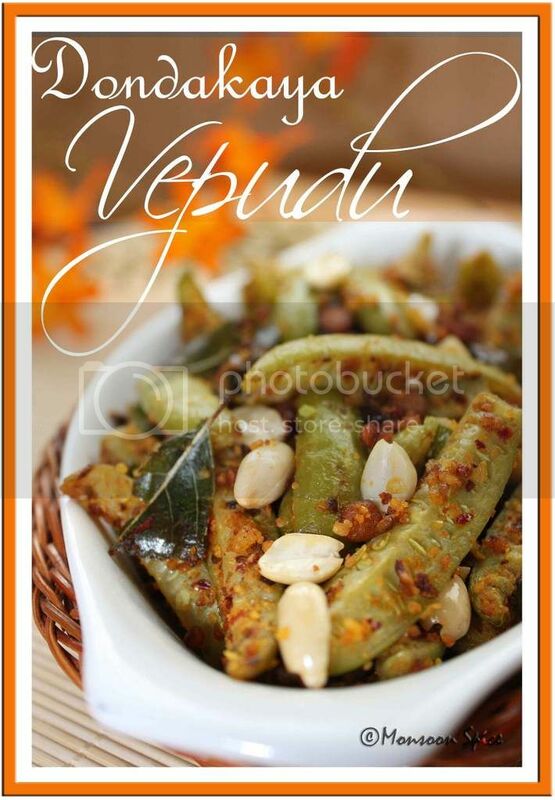 Monsoon Spice | Unveil the Magic of Spices...: Dondakaya Vepudu: What's in a Name? For those who don’t know what I am blabbering about, TonDekai and BenDekai are the names for Tindora/Ivy Gourd and Okra/Ladies finger respectively in Kannada. Growing up back in India, I always got confused between these two vegetables. Whenever my Amma asked me to buy TonDekai from vegetable shop, I ended up getting BenDekai and vice versa. Reason? Confusion in names, between single Kannada letters!!! For a girl who always won prizes in memory games, these two vegetable names were source of frustration and irritation. I would go to nearby shop and stare endlessly at these two vegetables trying to recall which one did Amma asked me to buy. Is it BenDekai or TonDekai? TonDekai or BenDekai??? B or T? T or B? TB, TB, TB, Tuberculosis??? At last I decided to do something about it. I decided to call Ivy Gourd as Man’s toes. Well, if Okra could be named as ladies finger for its appearance then Ivy Gourd very much looked like Man’s toes to me. Hence then onwards I asked Amma if she was planning to cook ladies finger or man’s toes for dinner! Sounds funny but was not that amusing for guests who were shocked when I told them they will be served man’s toes curry with Roti for lunch ;) Well, at last I was forced to remember their name as my parents were not very keen to develop the reputation of cooking and serving man’s toes for their unassuming friends. 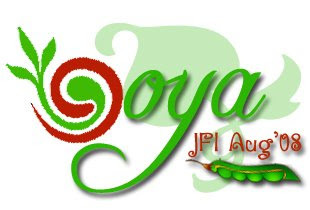 Growing up I always loved Ivy gourd, even when I was one rebellious teen. There was the time when my dad grew TonDekai in backyard. This tropical vine would give beautiful white flowers which grew into crunchy green fruits with thousands of small seeds in them. Eating young raw ivy gourd was one of my favourite pass times and I continued to religiously eat them till one day my Ajji told me it’s not good for memory cells. I am still not sure if there is any truth behind it or it was one of the tricks of my granny for to keep me away from eating all tender ivy gourds before they could be used in cooking. If you haven’t tasted this very young ivy gourd then I suggest you to do so when you get a chance. It is crunchy and totally delicious. Well, I wouldn’t suggest the same for mature ones. My favourite way to cook Ivy gourd is stir fried with cashews, simple stir fry and Mangalorean Huli-Menasina Kodhel. Amma also makes simple Tindora Rice which I will post sometime soon. 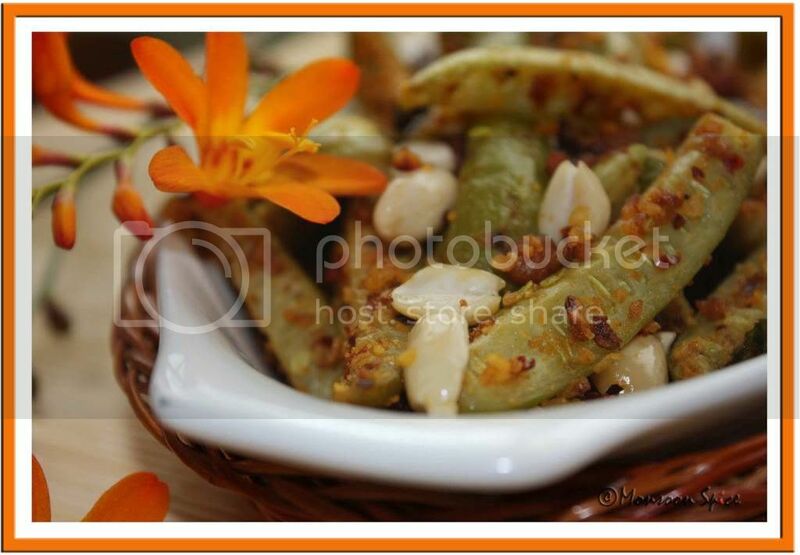 Recently I was looking for some new recipes to cook with Ivy Gourd and I stumbled upon Sailu’s blog where she has posted a simple recipe of Tindora stir fry with Peanuts called Dondakaya Vepudu. There I also saw a list of common names in different languages by which ivy gourds are known. TinDora, TenDli, TonDekai, Ivy Gourd, DonDakayi, Kovaikai, etc … I have come across all these names for Tindora but did you know it is also called as Gentleman’s toes? Now my name of Man’s Toes for TonDekai doesn’t sound too alien ;) coming back to the recipe, this is a popular Andhra style stir-fry from her Amma where the sliced Tindora is cooked with a tempering of fresh curry leaves and mustard seeds and then mixed with aromatic powder of roasted peanuts, dry red chillies and cumin seeds. One look at her photographs of the final dish I was all set to create this magic in my kitchen. I almost followed her recipe but tweaked little extra ingredients in tadka/tempering, along with roasted peanuts, which we normally use in Kannadiga Palya or stir-fries to add extra crunch. With in no time this delicious stir fry was ready to be devoured with steaming bowl of white rice and simple Tadka Dal. Next day I served it with fresh Chapatti and small bowl of Yogurt and the plate was licked clean. Thank you Sailu, for posting this delicious recipe which has become our family favourite and will again be cooked shortly. Heat few drops of oil in a pan and add cumin seeds. When they start to sizzle and turn light brown, add red chillies and sauté it for another 10-15 seconds on medium flame. Turn off the heat and let the spices cool. Add these roasted spices with roasted peanuts and grind into coarse powder. Keep it aside till needed. Heat oil in a same pan and add mustard seeds to it. When it starts to pop and splutter, add channa dal, urad dal, broken red chilli and sauté till dals turns light golden brown. Mix in hing and curry leaves and stir till nice aroma comes out, about 10-15 seconds on medium flame. Add the sliced ivy gourds and mix well. Mix in turmeric powder and salt to taste. Sauté it continuously on medium heat for about 4-5 mins, making sure it doesn’t stick to the bottom of the pan. Reduce the heat to low and cover and cook for another 5-7 mins, stirring in between. Make sure that you don’t over cook the gourds as it should retain its crunch. Mix in ground powder and combine well. Cook on reduced heat for another 2-3 mins till all the flavours blend well. 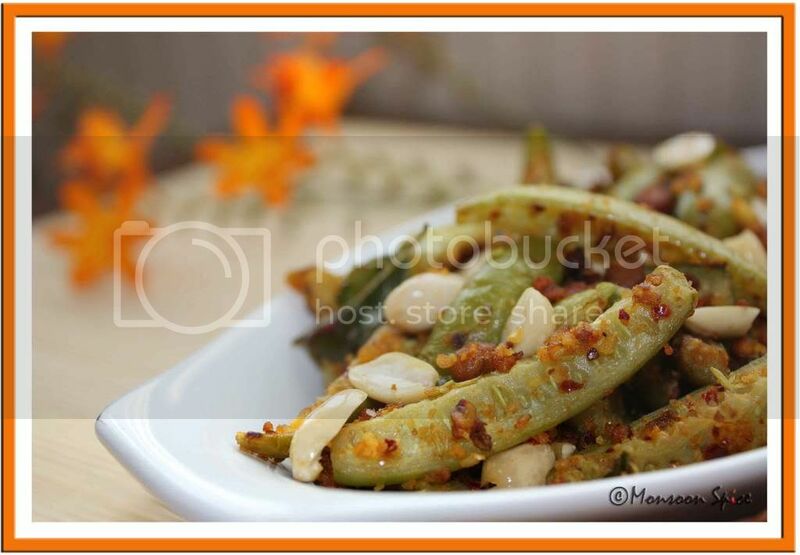 Garnish with roasted peanuts and serve hot with steaming bowl of rice/chapatti, dal/rasam/sambar and enjoy. I'm glad your family enjoyed it. Tindora is a favorite vegetable of mine and today was tindora stir fry for lunch, cooked with tadka and onions. LOL? man's toes... It is like a horror movie menu : man's toes curry...but tasty if u serve "Dondakaya curry"
Sia, did you have a good break? Tondekai, though I have seen them growing them in vines and eaten some of the ripe ones I have seen it being cooked till I was an adult. Now it makes its appearance regularly. Looks great with all the peanuts. I like the idea of adding peanuts to the tendli. Looks delicious, Sia. Lovely pictures. Fun writing Sia. My Sis used to get confused between Toor dal and Chana dal(by the looks anyway)! Men's toes - er ... yuck! (Am thinking of the real thing here) I prefer the confusion. :) I love dondakai, though, always have. And I have never heard of it being called Gentleman's Toes but I do know some people think this vegetable dulls the mind. A friend's mother stopped cooking this after someone told her that! The name ..funny,the writeup...hilarious,the recipe ....awesomwe,the pic....lovely...wht more can i say?? Hi Sups!Hope u had a great holiday. Enjoyed reading the post as usual. Love the dondakaya curry the way you made it. Mouth-watering! tht actually sounds funny, but u did find an easy way to rem them. a fun post. i have just written a post on south indian regional cuisines. i would love it if u could send me the link of a few of ure specialities, so that i can post them up. this one is an andhara special right?go thru my blog and send me some of ure recipe links. Nice! What's in a name indeed! Thought I say hi to ya this morning,have a long weekend so I can update you. We selected the cherry cabinets, Venetian Gold granite for counter top and tiles for the floor. Work will start in October as soon as the cabinets are ready. I am buying all stainless steel appliances in few weeks. For 4-5 weeks, I can't cook at all, can you believe that? Deepavali comes and goes without a thali this year I guess. It would be hard but we are also working on other rooms, keeps me busy. My mom never made tondekayi, not sure why. I've tried it a couple times, though with not great results, I must say. Pic is awesome. Never would have thought of tondekayi & peanuts in a palya! I make dondakaya similar way, my son is a big fan of dondakaya. Looks very inviting and delicious. what a funny story! The pictures are beautiful. SIA i love tendli/kundru, this recipe looks really yummy! You have a lovely place, though I don't comment much, I do read all your recipes and posts religiously! hi am back again after a break! am inviting u for my son amiitesh's b'day which falls on sep 3rd! the dish is looking so good!